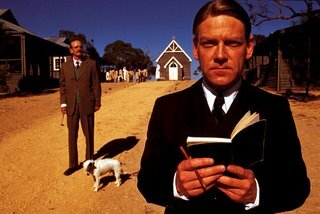 RABBIT-PROOF FENCE is an unforgettable film about an unforgivable governmental policy that will stay with you for a long, long time. Director Phillip Noyce (DEAD CALM, 1989; PATRIOT GAMES, 1992) helms this true story of three young half-caste girls who are abducted from their Aboriginal mothers in 1931 and relocated 1,200 miles away as part of an official government policy that is designed to train them as domestic servants and to effectively integrate them into white society. Almost immediately the three -- ages 14, 10 and 8 -- escape their forced internment and begin what can only be described as an epic trek across an unforgiving landscape. Constantly pursued by authorities including Moodoo, the Tracker (played perfectly by David Gulpilil who you will remember from his screen debut in WALKABOUT), the resourceful young girls follow the "rabbit-proof fence" which bisects Australia in their determined struggle to return home. This is an almost unbelievable journey of over one thousand two hundred miles, entirely on foot, with nothing but grit, determination, enough luck and enough pluck to actually accomplish the impossible. Kenneth Branagh portrays A. O. Neville, Chief Protector of Aborigines, a man blinded by Anglo-Christian certainty and a misguided evolutionary world view. His performance is nicely understated and surprisingly sympathetic. The three young Aboriginal actors who portray the escapees do so with charisma, nobility, intelligence and stength. All are exceptional -- especially given the fact that none had prior training of any kind. Everlyn Sampi as Molly is simply outstanding; I cannot help but believe she will have a long career ahead as an actress on both the stage and the screen. Peter Gabriel (of Genesis fame) was nominated for a Golden Globe for his effective and evocative score. It is just one more element of many that makes RABBIT-PROOF FENCE a remarkable cinematic experience. So grab yourself a couple of Foster's and a RABBIT-PROOF FENCE DVD, kick up your legs, sit back and marvel at what the human spirit can accomplish. Did you watch the extras on the DVD? The documentary footage of the sequence where they film the kids being taken away is as good as scene in the movie. The section on the casting process is great too--and it's narrated by what's his name--you know, Emma Thompson's ex. Did you know director phillip noyce has a new film coming out this year..."Catch a Fire"
i blogged about it today, i think it certainly has potential. As always, we here at the Needtovent Intergalactic Global Headquarters welcome your rantings regardless of the subject matter. We realize we have been remiss lately in posting new items on our blog, but a debilitating malaise has permeated the entire staff due to the Watergate-style break-in we suffered on July 4th. Out current priorities are to see if either G. Gordon Liddy or E. Howard Hunt are employed at the Bulverde HEB. Once we know something more definitive about this insidious organization we anticipate that we will be able to return to business as usual. Check out Full Frontal Nudes for the largest fully-searchable collection of free galleries on the net!